Continuing a series of posts on storytelling and some solutions for when we don’t really know the story. One challenge I have come across through ancestry research and putting together an ancestry album is all of the unknowns. Any attempt at trying to record history seems to be filled with unknowns. It can be frustrating. I have some old, wonderfully cherished photos, which are hard to come by in my lineage. But one thing that has continually struck me as a memory keeper is not knowing the story. It has encouraged me to be a better present day memory keeper and record more stories, writing as much information as I can in my scrapbooks and other journals. Initially it is discouraging, but as I’ve worked through it, I have come up with some ways to make it work and give more context. I’ve taken some ideas from creative writing education and other journaling techniques I’ve come to learn and use over the years. Stories can be told by posing questions. I don’t have all of the facts, but I use various clues and information to make educated guesses about what may have actually been going on. I pose these ideas as questions. For example, my Grandmother was very smart, skipping grades throughout school, but in her time she could only excel to be an Executive Administrative Assistant. I don’t know much else about what she did, but I can ask: Did it bother her that she was maybe smarter than the men she worked for? Did she want a more professional role? These questions speak more to the heart of the person and give a greater picture of someone, versus a snapshot of her standing in a hat & dress. Using other voices to tell the story can be helpful. I don’t have a lot of information, but I listen closely when my relatives speak about their parents or grandparents and I try to pick up on the subtleties. How their eyes and faces look when they recall a memory. I can use pieces of the stories they tell in their voice to add to the bigger picture, and take cues from their tone and facial expression to inflect the appropriate emotion. A lot of times people tend to recall a good meal the person cooked (which is one reason I try to feed my people well – it may be all they remember!) Another creative way to use voice is to give a voice to an inanimate object. Maybe a house that was lived in by generations or some type of heirloom passed down through family members. Using sentence fragments or bullet points or short phrases is not grammatically correct in writing, but is a good way to summarize somewhat disjointed ideas. I use this technique often in my scrapbook journaling separating ideas by dot dot dot (…) or two forward slashes (//). Another great way is to list ideas out with bullet points, which can be brads, stickers, or gemstones. I also like using small strips of paper cut up, a somewhat trendy look in scrapbook product right now. This works well in the typewriter because you can type onto various types of paper, whether it be pattern paper, journal card or a graphic paper bag. I think the hardest thing with studying ancestry is I’m less interested in what they did and more interested in who they were. As I think most people would be. I’m amused by those who are obsessed with job titles and assets. Have you ever seen a gravestone transcribed “here lies John Doe, he was a lawyer and owned a 4 bedroom house with 3 cars”? Probably not. Instead, you see “beloved husband, father & friend” or “faithful servant.” When you pass away, no one cares what you had or your job title, they talk about who you were as a person. If someone was caring or cold, social or quiet, out going or recluse, giving or selfish. Those are the characterizations you hear about. And making sure that comes across in the stories I tell is important to me. Keeping it authentic and real. Have you run into roadblocks when trying to research ancestry? What are your solutions for dealing with little bits of information? I’ve been writing a series of Storytelling posts lately and will be sharing them as quickly as I can get around to editing. Some of it is just to sort out my own thoughts on the subject. I often see questions posed by other memory keepers of how to tell a certain story, so I hope some of what I have learned through this hobby will help someone else. Writing & reading & creative expression have been major players in my life for as long as I can remember. Memory keeping for me has become the act of preserving stories through photographs, written words, and artifacts. The more I navigate my way through this hobby, I am searching for more, for the deeper undercurrent to it all. And it always comes back to the story. Giving life and feeling to a snapshot in time. Or even sharing words without a photo. I think as scrapbookers, we all start from a place where we have a photo of someone we love blowing out candles on a birthday cake and we caption the photo or layout with the title “Happy Birthday.” There is nothing wrong with that. The idea that someone is interested in memory keeping to begin with shows the depths of their soul and their commitment to a future where the past matters. But now I often ask myself, what more can I say? What more can I tell? Maybe about this person or the moment? Even posting a photo on Instagram. It’s easy to say my morning coffee, but think of how the story changes if it’s captioned a warm way to start my day. In some ways I think it’s ok to embellish stories a bit. I mean, it’s happened for all of history. Just like playing the telephone game, when it gets to the last person, it’s always a little bit different. You don’t want to completely falsify it, but just imagine if J.K. Rowling had only said there was a boy with brown hair and he does magical things. Guessing we wouldn’t know the enchanting world of Harry Potter. How do I feel about the person in the photo? What is in the scene but not captured in the photo? What is just beyond the edge? Describe the smells, tastes, or other physical feelings that were alerted in this moment. What emotions do the colors evoke? Can you share a poem, quote, lyrics related to the color or object? Does this photo/story invoke a reflection into something of the past? A childhood memory or early relationship event. If some future relative is looking at this scrapbook, what do I really want them to know? What feelings do I want them have about it? What message am I trying to convey? I think also keeping in mind it doesn’t have to be a perfect narrative with accurate grammar & punctuation. It can be how I talk. It can be bulleted points or maybe strips of paper with various thoughts. A lot of times what I want to say/share is not a perfectly structured story in my mind or in real life. So there’s a dynamic to it. Tell the story. Start somewhere and it will flow. I haven’t had enough spare time to spend in the studio lately, but there are little indications of progress. I just received these Midori travel journals for my birthday and am looking forward to using them. These ones are blank kraft paper, but I would also like to check out grid. I’ve been inspired by what I’ve seen other scrappers doing with them, including Amy Tangerine and Kelly Purkey. There’s also some great photos on Instagram, with the hashtag #Midoritravelersnotebook. I’ve always loved the idea of scrapping on the go, but haven’t always been successful with it. I have an upcoming short trip to visit family and check out a pretty area of the country for a few days, so hoping to put it to use starting there. I’m still deciding if it’s something I want to make a part of a larger book (like by using the actual folios) or just leave them separate. My guess is I will leave them separate and add to them as I go along, chronological recording has always worked for me and is simple to adhere to. In my quest to be more selective with what I scrap and what stories I tell, I haven’t been ordering as many prints as I used to. Plus, instead of printing a bunch of 4x6s, I find I want varied sizes for different projects. I don’t have a great system for printing at home because the laptop I’m running on now is pretty slow, so I tend to put that off. I am hoping to get a new Mac soon, but until then I find I need a quick, resourceful way to print photos. I have been drooling over the Instax printers for over a year now, but can never justify the expense with having to buy the film refills. So once I got my new Iphone 6 and was able to actually download newer apps (I was stuck on Ios 6.0 with my old Iphone 5!) 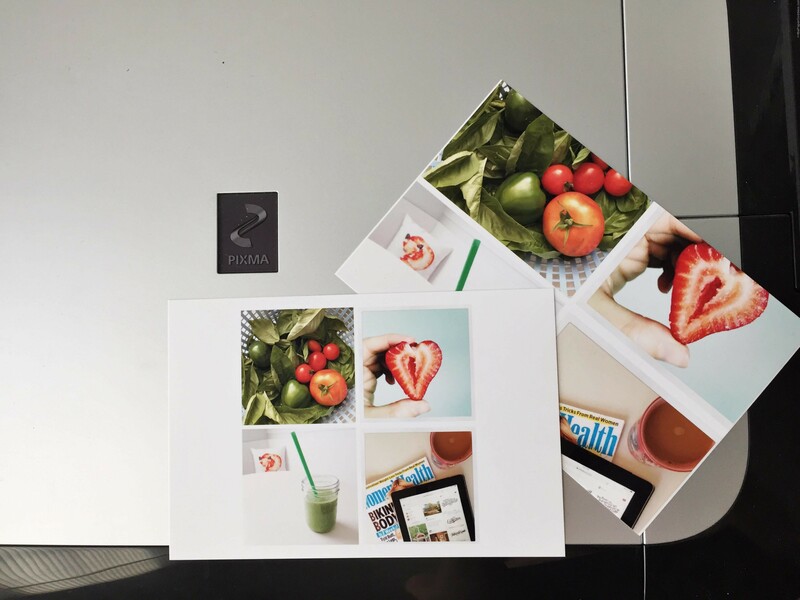 I was able to set up the Canon Easy-Photo Print app with my Canon Pixma printer to print wireless. I literally had 15 minutes last week to set it up and see if I could print a few mini photos. I used the Pic Stitch app to get 4 on the page. My only complaint with the Canon Easy-Photo Print app is it’s very basic and there are few customization options. You cannot select a print layout, so for this it was trial and error. At first I had it set to Borderless which resulted in the pictures being skewed off the photo paper, so after correcting to Border print, I was able to get the 4 square mini photos. They are small, but for a lot of what I’m doing lately it works. I was thrilled this whole process took me 15 minutes to figure out and now I can print photos out more regularly and try to stay current with my storytelling. I also have heard good things about the Photo Collage app, so I want to check that out. I am determined to get more into my ancestry project and have been doing little things lately to prep. I’ve been visiting my tree and data I have online at ancestry.com, as well as any paper documents I have to refresh myself with what areas I need to focus on. I picked up this Karen Foster page kit a few years ago at a CKC Convention. My plan is to use it to help record some data, I don’t think it will be part of the actual project. I’m really leaning toward a digital book of some kind, and thinking the 8.5×11 style would work best. Especially now that I’ve seen these lay flat albums from Artifact Uprising. I do want some depth in some cases, so there may be traditional pages incorporated and possibly scanned in for digital copies. I don’t want to get too hung up on the style, I really just want to start digging into how I am going to go about presenting the information and telling stories. One thing I have to do is get the pictures organized that I want to use. Right now for all of my filing for projects I use this portable file folder holder. In it I hold calendars with events, as well as memorabilia and separate those by year. I also have folders for holiday specific items and a folder for all of my ancestry documents. This is something I had on hand that I wasn’t using for paperwork anymore. I’ve been doing really well at just reusing what I have and finding things that work around the house versus purchasing new items. I am proud of that! This is a little bit of what’s been going on in my studio. 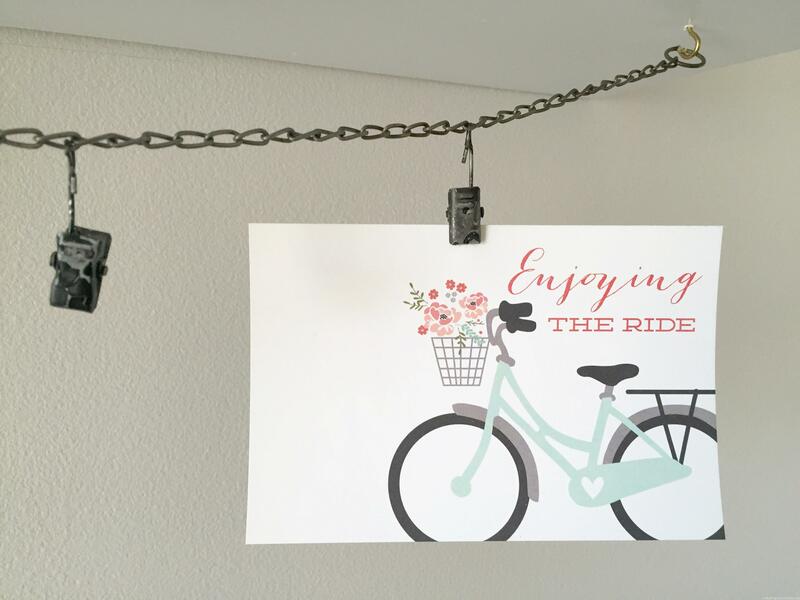 The Enjoying the Ride card is by Simple Stories and was included as a freebie in a recent scrapbook.com order. I hung it up on my chain that goes along the wall of my studio. It pretty much sums up how I feel everyday! What is going on in your studio? 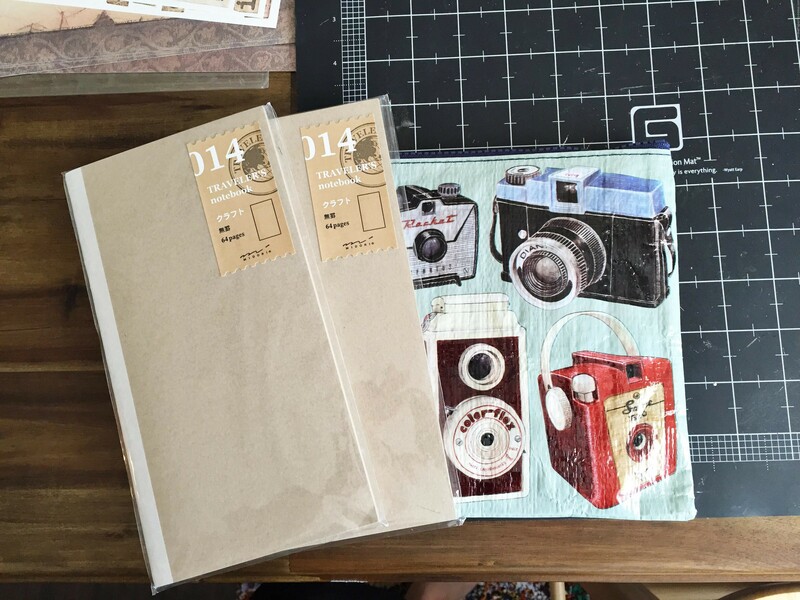 What projects have you done with the Midori travelers notebooks? 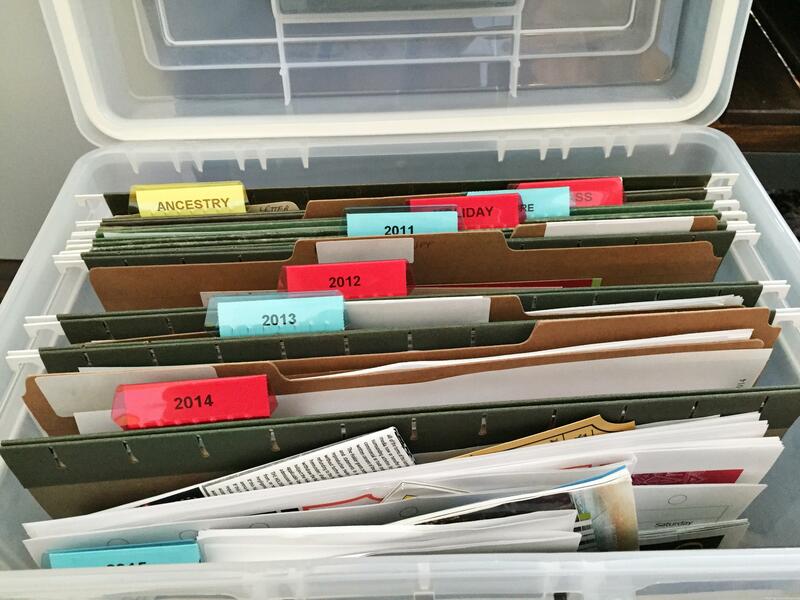 Do you have an ancestry album or plan on making one? Any ideas or tips for research? What apps do you rely on for printing photos?